Student pilots are taught very early on to recognize that when an airplane approaches its minimum flying speed, the airflow over the wing will begin to separate or break down, creating turbulence over the tail. The degradation of lift and the associated turbulence over the tail causes the airplane to buffet and alert the pilot to a deteriorating and dangerous situation. The recovery is rather basic – lower the nose some, apply full power to the engine and let the airplane fly out of it. As it accelerates, the buffeting will end and the aircraft will safely regain both flight and controllability. In the 1930’s, military and large civilian airplanes were being equipped with supercharged and turbocharged engines. These engines enabled the planes to fly higher and faster than airplanes with normal engines. However, these “boosted” engines required a pilot with a delicate hand on the throttles. Whereas a normally aspirated engine could run at full throttle continuously without much more than some added wear, the supercharged and turbocharged engines would run beyond the normal power limits creating excessive heat which, in minutes, would damage the engine. Only when the situation was critical could a competent pilot consider “firewalling” the throttles by pushing them to the stops and exceeding the manufacturers’ limits. When the turbojet airliners appeared in the late 1950’s, engine heat became an even more critical issue. Firewalling these engines would result in immediate engine damage from the heat, while only providing a small gain from accelerating the engine past takeoff power. This is because the supersonic exhaust stream beyond the takeoff limit “chokes” in the tailpipe and the additional thrust is lost, becoming marginal at best. Fast-forward to June of 1975. 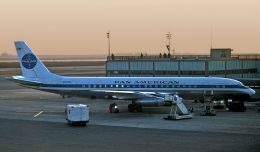 The first officer was at the controls of Eastern Air Lines Flight 902, a Lockheed L-1011 on a routine approach into New York, save for the 43,000 foot high thunderstorm just outside of the airport. 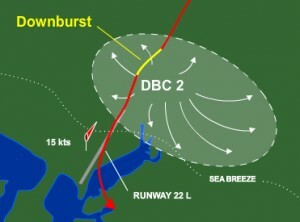 At 300 feet on descent, the approach became unstable due to a sudden change in wind speed and direction — windshear — and he elected to go around. Flying by the seat of his pants and feeling the airplane continuing to descend, he pulled back on the yoke, ignoring the low airspeed and associated stall warning indicator, putting the Lockheed widebody in a precarious situation. Simultaneously he firewalled the engines, and fearing imminent touchdown regardless of his efforts, the flaps and gear remained in the landing positions and were not changed to the go-around settings. 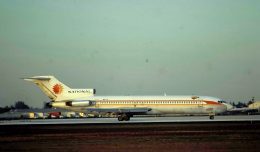 Captain Clifton Nickerson then assumed control on the go-around, per company procedure, and returned the L-1011 to normal flight. 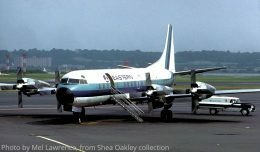 The crew’s actions that day put them under intense scrutiny from Eastern Air Lines; the aircraft’s three Rolls Royce turbofans were severely damaged from the excessive heat during the go-around. 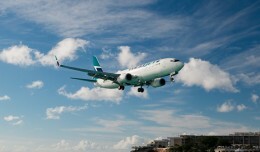 The airplane had been operated contrary to company procedures and the airplane’s limitations had been exceeded. Captain Nickerson, disheartened from the treatment he received, retired early and walked away from aviation. Minutes after Eastern 902’s go-around, Eastern 66 was not so lucky, falling short of JFK’s runway 22L, onto Rockaway Blvd. 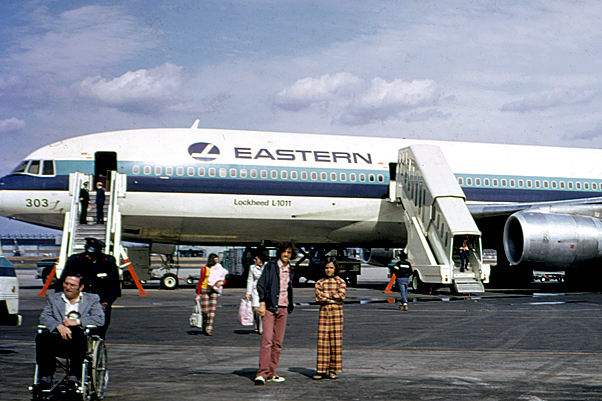 The crew of Eastern 902 remained under the scrutiny of their fellow Eastern pilots and the FAA officials — not because of what happened to Eastern 902, but what didn’t happen. 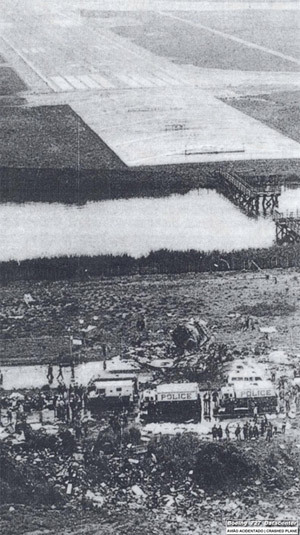 Eastern Air Lines Flight 66, a Boeing 727 just three aircraft behind, crashed short of JFK’s runway 22 Left, killing 113 out of 124 on board, forced out of the sky by what we now know as a microburst. 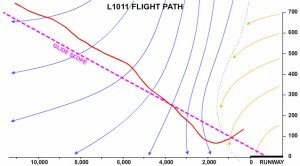 Post-crash analysis of Eastern Flight 66 showed that among the fluctuations of wind speed and direction, Eastern Flight 902 had experienced a 35 mile per hour loss in airspeed, and though they applied full throttle while descending through 250 feet, the aircraft made it down to 60 feet before starting to climb away. 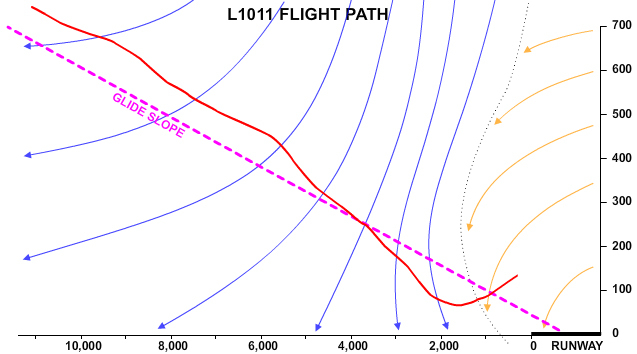 The first officer’s actions on Eastern 902 that day and prior to this time were thought to be in error, but are what we now teach as the “Windshear Escape Maneuver.” If an airline pilot encounters severe windshear, the engines are to be firewalled, the configuration is maintained, and the pilot is to keep pulling back on the yoke until the descent rate is stopped or a stall is imminent. In the immediate years following, this technique was not well accepted as decades of training and pilot lore sometimes found this new idea suspicious and unproven. It wasn’t until another L-1011 found itself in a similar situation that things really changed. An overhead view of Eastern 902’s approach in relation to the runway and the microburst. A decade after Eastern 902, Delta Flight 191 encountered severe windshear on approach to the Dallas Fort Worth airport and crashed. During the investigation, government and industry experts loaded the flight and weather data from Delta 191 into flight simulators and concluded that had the crew behaved like the crew of Eastern 902, Delta Flight 191 may have survived. This solidified the windshear escape maneuver as part of the training for transport category airplanes. Air carrier pilots in the years following all had to successfully fly “the Dallas windshear” on company checkrides. With the information we now have, the newest generation of doppler radar, windshear detection equipment at airports, and flight crews alert for this kind of weather, airliners almost never encounter severe windshear. In the rare case they do, these crews have been trained on how to properly respond. Every accident is scrutinized, evaluated, and often changes are made in response. Eastern 902 is the one exceptional case of what we have learned from an airplane that did not crash but safely flew away. NYCAviation Founder Phil Derner contributed to this article. Makes you feel pretty badly for Capt. Nickerson. Some years ago over Lake Pontchartrain, Louisiana “Snuffy” Smith aka Capt. C.J. Smith was flying a B-720 when his pitch trim compensators locked in the up position. He was on final approach to New Orleans Airport. The aircraft pitched over into a dive to the water. The first office was looking through the manual to find out what to do. The Captain lower the wheels and extended to full flaps and put the engines in full reverse. The aircraft almost came apart but he pulled it out of the dive and managed to land. The aircraft could not be salvaged. I wonder if that procedure made it to the simulator. I read about Capt. Nickerson’s brave actions on a National Geographic magazine article almost 30 years ago. it was a short one but I was immediately impressed with Capt. Nickerson’s and his first officer’s actions and the positive end result. I hope that the now defunct airline’s reps at one point apologized to those heroes.